Among lighting manufacturers there was a trend a couple of years ago to make really big flash units to match the oversized Nikon SB-910 and Canon 600EX flagship models. Since then the fashion shifted and the third-party firms are trying to appeal to users of small DSLRs, compact system cameras and point-and-shoots, with big features packed into small lights. Recently we reviewed the Nissin i40 for Micro Four Thirds and for Fujifilm — a small form-factor flash with full manual control, TTL, an LED modelling/video lamp and an optical slave. MeiKe has tried to do one better with their MK320, which is even smaller yet manages to boast a very similar feature set. International seller Mcoplus kindly provided a Micro Four Thirds sample for this review, as well as providing samples of the other versions, which will feature in future articles for any system-specific differences we notice. In the past MeiKe Speedlites have been fairly cheap and cheerful fare. Before even opening the box, it is clear the MK320 represents a departure from this; the packaging is nothing short of premium, with textured material, custom-moulded foam and an elegant design. I feel like I am unpacking a new bottle of perfume, a smartphone or a fancy watch, rather than a relatively affordable third-party flash unit. Obviously this has no effect on the quality of the flash itself (except maybe protecting it in transit) but it shows that this Chinese brand is keen to rehabilitate its image. Included in the box is the flash itself, a drawstring soft case (nylon on the outside, fleecey on the inside), the usual little table-top stand and a diffuser cap. The case is big enough to hold the flash with the diffuser and stand all at once if you need. Mcoplus, who supplied the samples for this review, also throw in a lens-cleaning brush with each unit, which is nice of them. The first thing that strikes you about the MeiKe Speedlite MK320 — and indeed its primary selling point — is its small size. 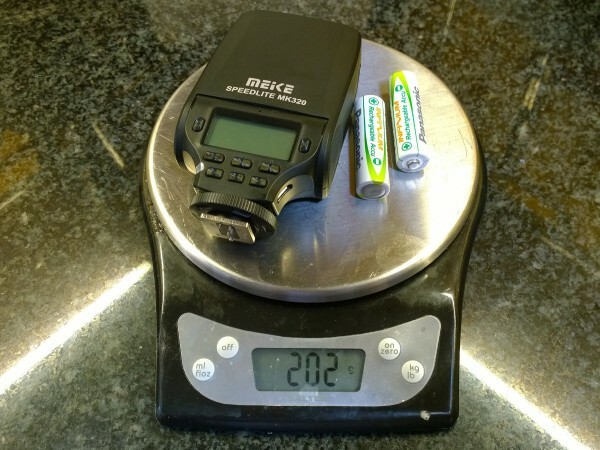 Unlike most flashguns the MK320 runs on two AA batteries rather than four, allowing the manufacturer to cut down the dimensions considerably. With batteries, the unit weighs just 200 grams. 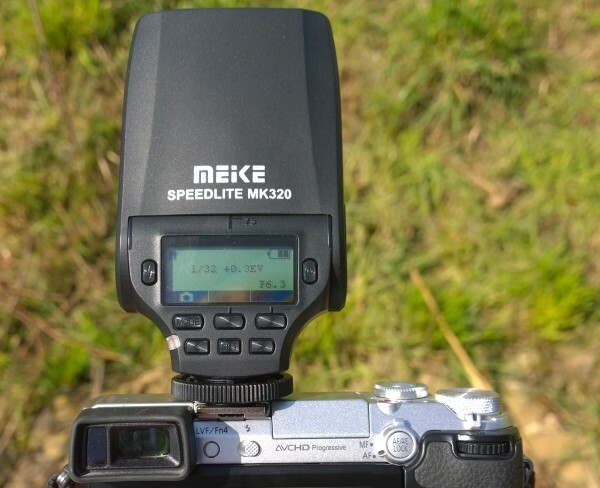 Despite its minuscule proportions — about half the size of your average speedlight — MeiKe nonetheless managed to find room on the MK320 for a 1.5-inch dot matrix LCD and no fewer than eight control buttons. These aren’t squishy, cheap and nasty buttons either: they have a posh metallic effect (though actually plastic) and engraved markings making them a pleasure to behold and to use. The battery door, often the weakest point of a flash, feels decent; I cannot see it breaking off any time soon and it seems nice and secure. In the past I have had problems with dodgy connections in MeiKe Speedlite battery compartments, which bricked two or three flashes, but I can’t see this being a problem here as the MK320’s batteries are loaded sideways like a TV remote, making any corroded terminals or bent springs easier to service. So far, so standard: it’s a small flash of reasonable quality. But there is one game-changer feature that I have not seen anywhere else: USB charging. 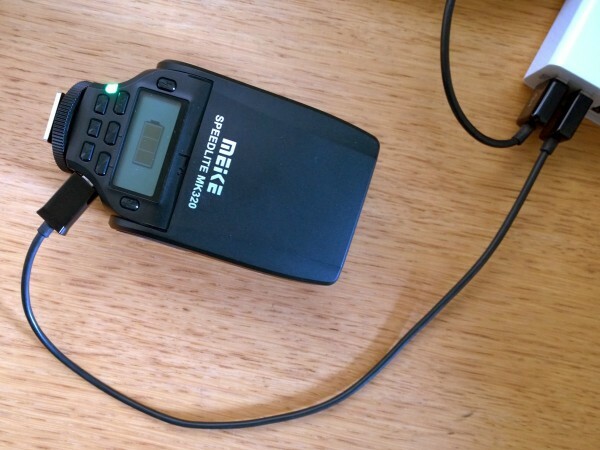 The MeiKe MK320 has a microUSB port and you can use it with any 5V, 1A power supply to charge your pair of AA batteries while they are inside the flash. Imagine the saving in weight and space this affords you if packing for a trip somewhere: no AA charger and no spare batteries; just a micro-USB cable that you were probably bringing anyway to charge your smartphone or e-reader. The charger facility will stop when your batteries are topped off, and it doesn’t seem to face any problems with lower-voltage NiMH batteries. I have been using the same set of batteries with my MK320 since I first received it, thanks to the USB charging. The MK320 is the first flash in this series (c.f. 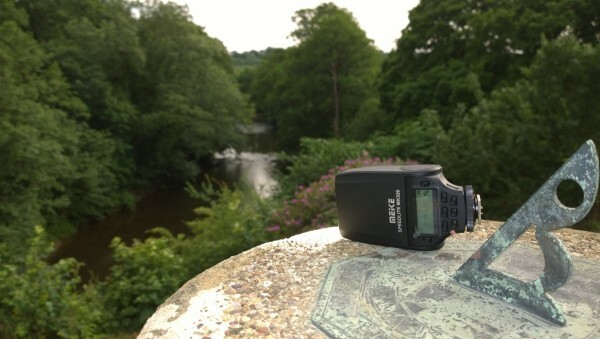 the MK300 and MK310) to have tilt and swivel, which is unusual for a flash so small. The Nikon SB-400, upon which the design is clearly based, has a tilting fresnel but does not swivel and otherwise has much more limited controls and generally an inferior list of features. The addition of vertical and horizontal rotation means you can use this flash bounced off walls and ceilings, greatly improving the potential quality of images you can create with it mounted on-camera. However, the range of motion is a bit limited: it only goes 60° to the left and 90° right, which is frustrating if you want to bounce off the wall behind you or on your left. Hopefully a future MK-330 model will swivel the whole 180°. This is one point MeiKe loses to Nissin, whose rival i40 flash moves much more like a full-sized speedlight. Unlike a full-sized speedlight however, the MeiKe MK320 is one of the only flashes that feels balanced on my mirrorless camera. 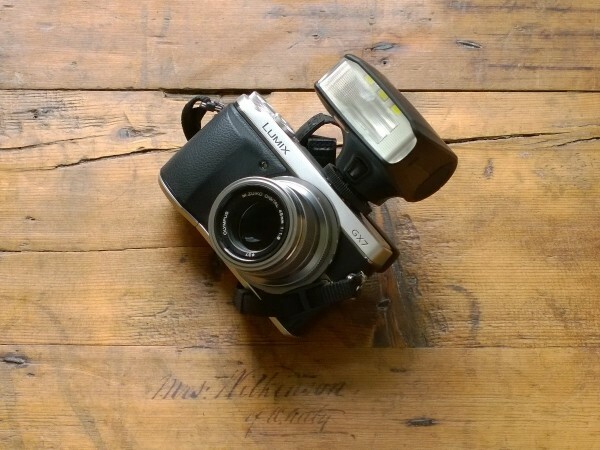 It is small and light enough that it does not tip forwards awkwardly when around my neck, and you can leave it on the camera even when not using it without it feeling cumbersome. One area where this flash excels, however, is in its user interface. Rather than the retro-styled control dials of the i40 (prone to being knocked out of place), the MK320 has a modern LCD control panel with much finer adjustment, including flash exposure compensation from –3 to +3 EV in TTL mode, and manual power control down to 1/128 power, both in 1/3-stop increments. The menus are easy to navigate and clearly displayed. There are even customisation options, such as how long you’d like the flash to wait until it goes to sleep (one, two or three minutes or disabled) and enabling or disabling the LCD backlight. As well as the micro-USB charging, another unusual feature is the LED lamp. It consists of three LEDs tucked inside the flash head itself, so whatever they light up will be a close approximation of a flash exposure (unlike most other speedlights with LED lamps). The specs (and the custom functions menu) seem to imply this works like an AF-assist lamp, but in my experience with the MK320P on the GX7 I could only enable it manually: tapping the power button will toggle it on or off. The LED will switch off automatically when the flash fires. Perhaps this works differently on the other versions. The LED lamp is a brilliant addition for previewing the spread of light in off-camera lighting setups. The light is not very bright (and not adjustable) so it only works in fairly dim studio-like environments but it turns the shooting experience from chimping to WYSIWYG. 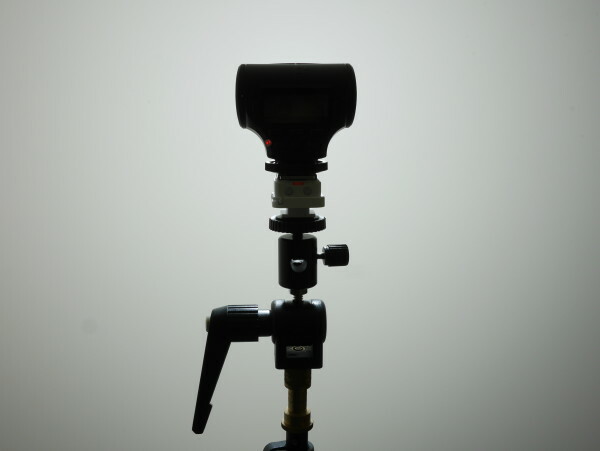 I think all speedlights should implement modelling lamps like this. The MK320 works well on- and off-camera. I had no issue using the FlashQ radio triggers to sync it with my camera. The optical slave S1 (“dumb” slave) mode works fine too with manual flash. The S2 (pre-flash-ignore) mode however does not appear to be programmed for Micro Four Thirds TTL pre-flashes, because it rarely synchronises with my GX7’s pop-up flash in TTL mode, whereas S2 mode works perfectly fine with the built-in flash of my Nokia Lumia 1020. I found I could get away with using S1 mode at lower power levels however. The MeiKe MK320 has a fixed beam angle, equivalent to a 24mm focal length on full frame. 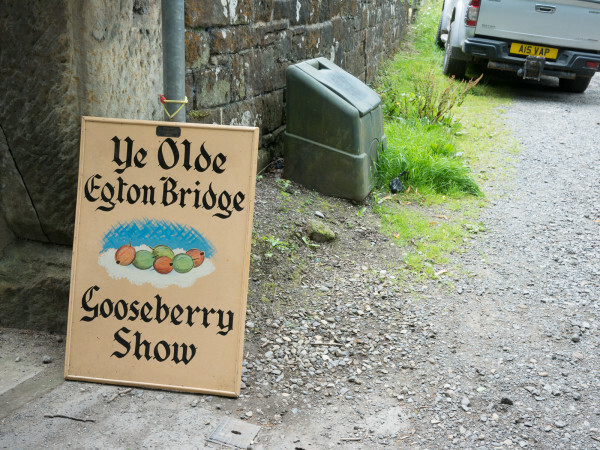 Under the same conditions, using an incident light meter I measured f/22 at one metre and f/13 at two metres from the MK320 at 1/1 power, compared to the Yongnuo YN560-III, which yielded f/36 and f/20 respectively at its 24mm setting. That’s about a stop of difference — i.e., the Yongnuo is twice as bright. However, note that most flashguns have a zoom feature: at a tighter 50mm setting the YN560-III measured f/40 and f/26, so if you are shooting predominantly with longer lenses then you get more “effective” photons with a flash that can zoom in, thereby not leaving light outside the frame. The light spread from the MK320 is smooth and even, without an overly-bright hotspot in the centre or any unusual patterns produced from the fresnel. The manufacturer states a 5-second recycle time at full power. You can actually fire the flash before it has fully recycled, so if you are shooting high-speed bursts then you won’t miss a shot completely but might get slightly lower output if you are too quick. The recycle time depends on the type and condition of your batteries but with fairly old NiMHs I seemed to get around 7 seconds. There is no support for external battery packs (other than for charging your AAs through the microUSB port) so if you need a flash for capturing highly-lit, high-frame-rate photography, keep looking. At lower power levels you won’t have to wait so long. As far as I can tell, this flash does not have high-speed sync. My Panasonic GX7 does not let me access shutter speeds above 1/250 second when the flash is attached. I also tried it on the Olympus Stylus 1, which permits shutter speeds up to 1/2000 second but it is a compact camera which has an electronic shutter. I am not an avid user of TTL or direct on-camera flash, but it certainly has its place. 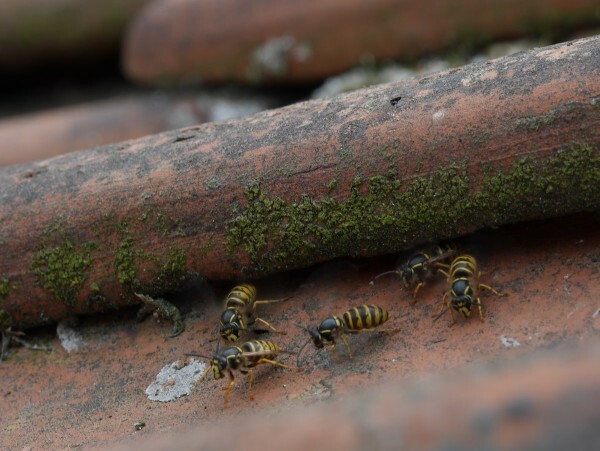 For instance, if wasps build a nest in your roof and they sit at the entrance flapping their wings to cool the colony, it would be nice to capture an image of that event. 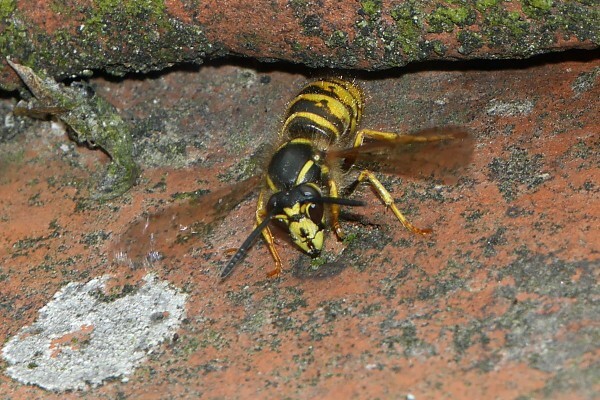 Here is my first attempt, sticking my arm out of the window and trying to steady a long lens for a close-up shot. The natural lighting looks nice but there is blur from camera shake and it is hard to see the insects’ wings because they disappear in a whirl of motion. Introduce the MK320 for some on-camera TTL flash, and the moment is frozen in time much more clearly, albeit with harsher, less directional lighting. The –7° tilt of the flash head came in useful for this close-up shot. I haven’t faced problems with the MK320’s TTL exposures. 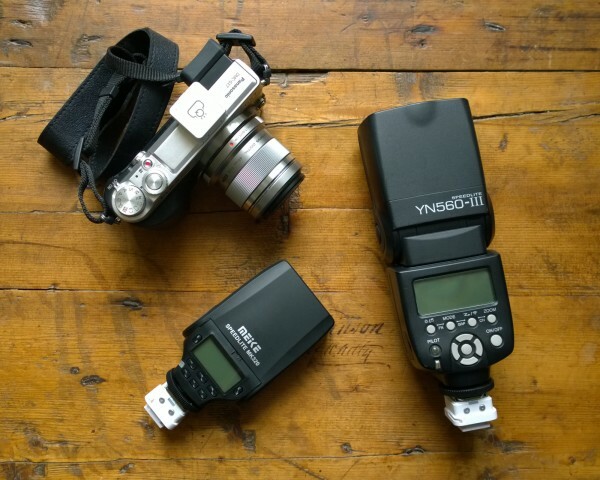 They are about as accurate as you can expect, and the LCD user interface makes it quick and easy to dial in flash exposure compensation as required. The usual constraints of automatic exposure calculation apply: if you go from shooting black cats in a coal mine to polar bears in a snowstorm, expect to provide some input or everything will look 18% grey. One non-obvious benefit of TTL is that it lets you use lower power levels than the minimum 1/128 setting in manual mode offers. 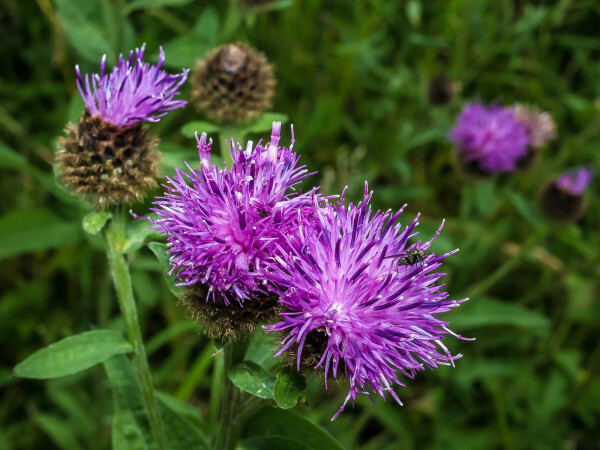 For close-up photography this is invaluable; the following image was captured with the MK320 in TTL mode with around –3EV in exposure compensation. 1/128 power was just too bright in this case. When using bounce flash, I find TTL to be a bit underwhelming, especially if I need near-maximum output. In this case I like to switch to manual mode. 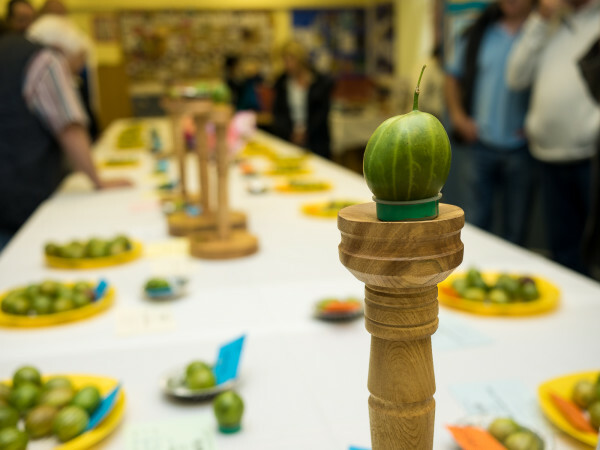 The bounce feature and manual power modes came in useful when visiting the 215th annual Egton Bridge Gooseberry Show — the event is held in a flatly-lit schoolroom and a bit of ceiling bounce (say 1/4 power) can bring out the colour in those prizewinning entries. 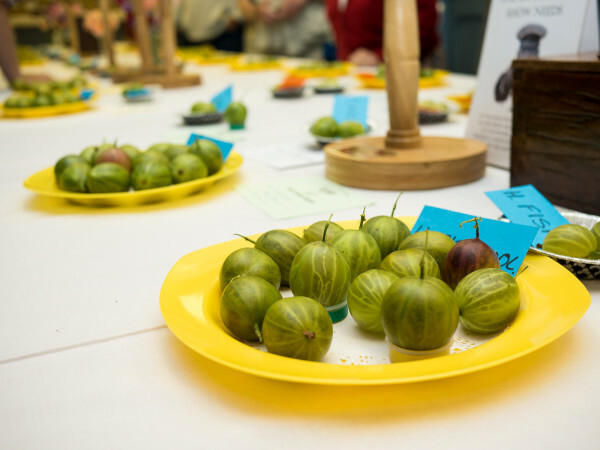 The easy operation of this flash meant that in the total time I could allocate to a Gooseberry Show before getting bored and leaving — about four minutes — I was able to get a number of serviceable photos to document the event and share with my (envious) friends and family. Overall for everyday events the MK320 seems to be up to most tasks you can throw at it. Not being able to bounce the flash behind you can feel limiting at times but there are nearly always ways to work around it. And when it is this small and light, it almost feels harsh to ask too much. 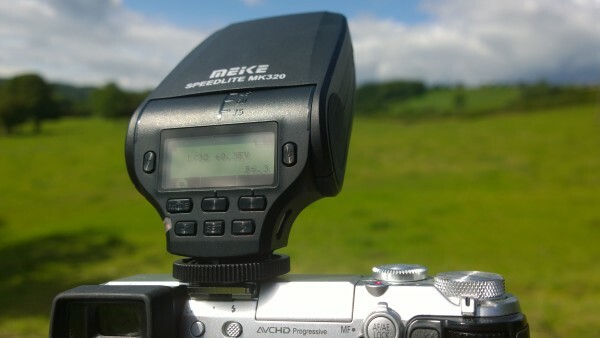 The MeiKe MK320 is a very nice little flash that would do nicely in the hotshoe of many Micro Four Thirds cameras. 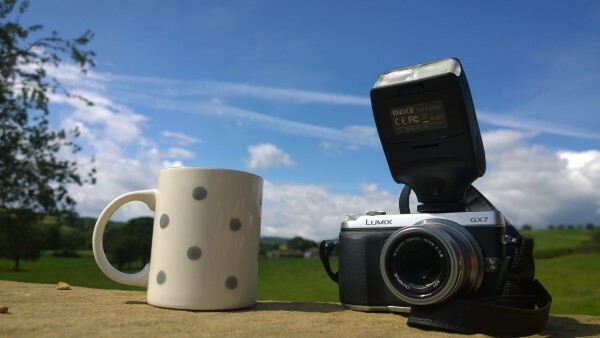 It feels balanced on the Panasonic GX7, is easy to use and can be used for direct TTL or bounce flash. 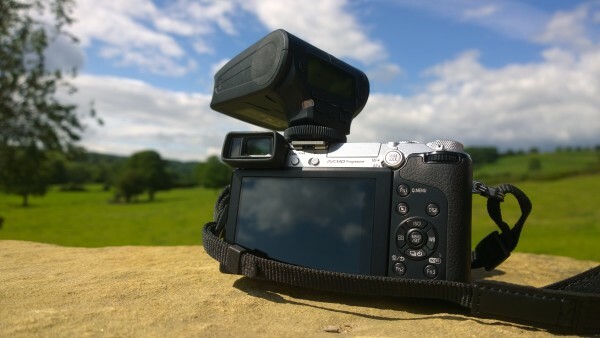 If you are looking for a flash primarily for off-camera use then you might prefer a flash with more power, faster recycling and a zoom function, though the very small size and weight and microUSB battery charging are attractive features for anybody with very limited space in their camera bag. 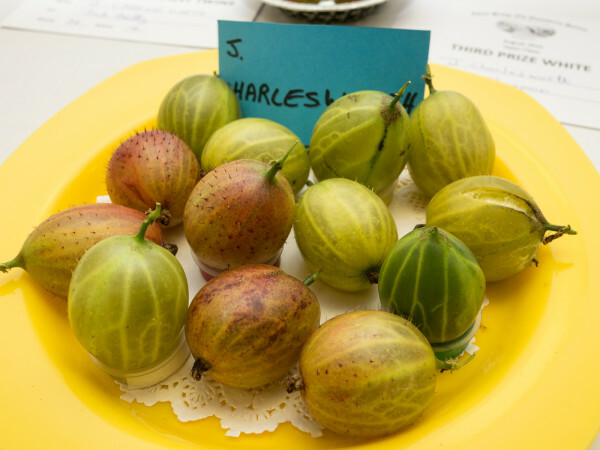 As a “walkaround” flash for amateur photography and social events, you really cannot go far wrong with the MK320. If you are looking for a compact flash unit for a small camera then I can think of only two serious contenders: the MeiKe MK320 and the Nissin i40. Compared to the Nissin i40, I think I prefer the more modern user interface of the MK320 as well as its more sensibly-designed modelling lamp, but the i40 has more freedom to swivel and zoom for bounce lighting, as well as slightly better performance, at the cost of some size and weight (and about three times the price). 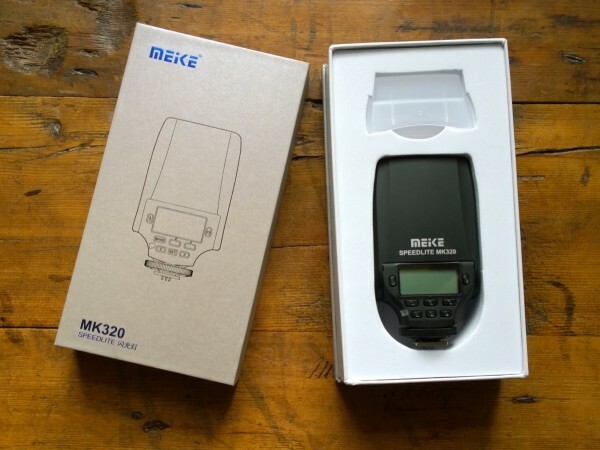 If space is at an absolute premium then the MeiKe MK320 is your best bet: tiny proportions, airy weight and it makes AA battery chargers redundant! For more information, visit the Mcoplus web site.